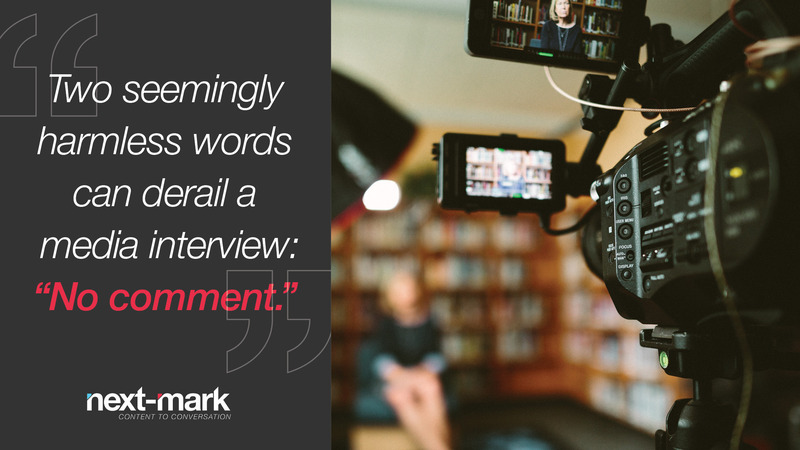 Let’s be honest – even the mostly highly trained communications professionals still get nervous before an interview or a media relations appearance. Positive, “earned” media is as good as gold in the marketing communications world, but a fumble, an off-color joke or an out-of-context statement can quickly shift the conversation to uncharted territory. So what happens when you’re contacted by a reporter armed with hard-hitting questions? Here’s how you can make the most of the media interview/public relations opportunity you’re given. If you get an unexpected call from a journalist, don’t feel pressured to answer their questions right away. Politely ask the topic of the story and the timeline, then schedule the interview for a later date. Even if you know the topic well, you need time to research the news outlet and prepare. The reporter should respect your request. And if they don’t, simply say that you don’t have time to discuss the topic at this time but would be happy to follow up with an email response when you’re able. Before you head into your interview, make a list of several points you want to get across in the interview. These should be simple, direct and relevant to the topic the journalist is covering. Be aware of trying to sneak in comments that are irrelevant or seem too “promotional”. If it’s an interview for a print news outlet, the journalist simply won’t include the comments; if it’s a TV or radio interview you might appear self-serving or desperate. The messaging should also be free of jargon. Practice elaborating on your notable points without using industry lingo. This way, journalists are more likely to quote you rather than interpret your comments themselves. Finally, remember that reporters love human-interest stories readers can easily relate to or connect with. So whether you’re addressing a crisis situation or simply sharing the history of your company – always focus on people! There may be certain questions you simply can’t answer. Depending on the situation, consult with your legal and policy experts, as well as your marketing communications team, about what you’re allowed to address and what you need to avoid. Don’t allow reporters to pressure you into giving up information, even if they say they won’t attribute it to you. Additionally, never say “no comment”! Unfortunately, those two seemingly harmless words often imply guilt and can lead the journalist to make assumptions or fill in the blanks. Instead, have a few other canned responses prepared. Media relations is an important part of growing your brand’s presence. And it’s one part of our many services here at Next-Mark! If you have a story to tell, let us know – we can help find the right news outlet, set up media interviews and hone your talking points.